The Icelandic Art Center, commissioners of Christoph Büchel’s The Mosque, has abandoned its legal appeal against the Venetian authorities' closure in May of the Icelandic Pavilion. The Icelandic Pavilion launched at the 56th Venice Biennale to a flurry of interest back in May – it had, after all, turned a former Catholic church into a non-functioning mosque. 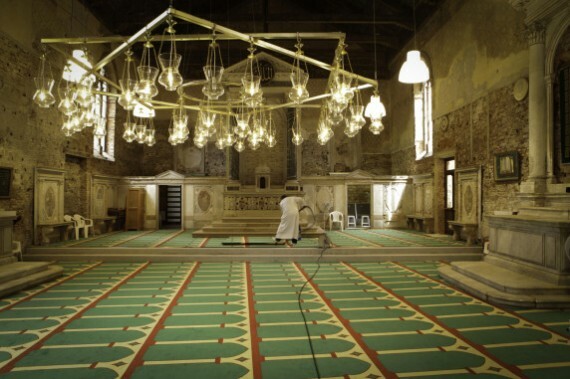 But within less than two weeks of the opening of the 2015 Venice Biennale, The Mosque by artist Christoph Büchel had been closed by the Venetian authorities, citing health and safety reasons. In that short time, it had been embraced by some of the city’s 20,000 Muslims as a place of prayer in a mosque-free city. Now, a legal appeal to the Regional Administrative Court in Venice by pavilion commissioners the Icelandic Art Center (IAC) – which included a request on 29 July to fast-track the process to enable a chance to reopen before the end of the Biennale in November – has been abandoned. The IAC’s move follows the court’s decision on 31 July to reject the fast-track request. This means that any hearing on the matter would be unlikely to happen until next year. In an earlier statement on its website, the IAC outlines its reasons for originally pursuing an appeal. In doing so it is critical of the Biennale for not supporting it when it was initially closed down by the authorities on 22 May. The IAC’s appeal, presented by Padua-based lawyer Marco Ferrero, included testimony from internationally acclaimed art historians and curators stating that The Mosque was indeed a work of art. Opinion, though, has been divided on the merits of Büchel’s piece, with some dismissing it as an insensitive act that has made things worse for Muslims in the city.